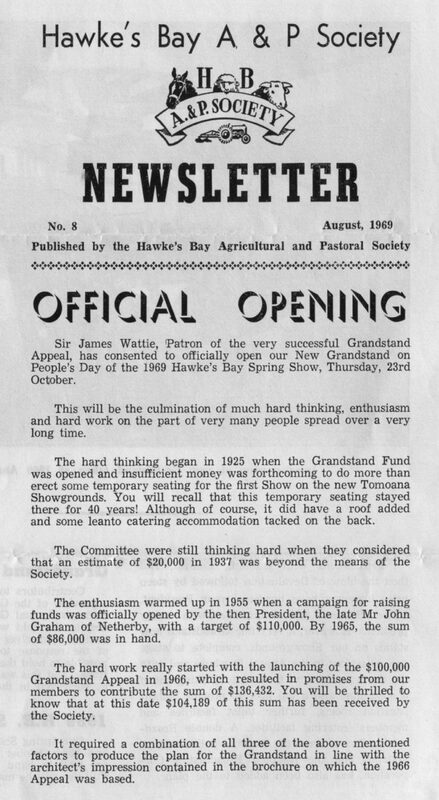 Sir James Wattie, Patron of the very successful Grandstand Appeal, has consented to officially open our New Grandstand on People’s Day of the 1969 Hawke’s Bay Spring Show, Thursday, 23rd October. This will be the culmination of much hard thinking, enthusiasm and hard work on the part of very many people spread over a very long time. The hard thinking began in 1925 when the Grandstand Fund was opened and insufficient money was forthcoming to do more than erect some temporary seating for the ﬁrst Show on the new Tomoana Showgrounds. You will recall that this temporary seating stayed there for 40 years! Although of course, it did have a roof added and some leanto catering accommodation tacked on the back. The Committee were still thinking hard when they considered that an estimate of $20,000 in 1937 was beyond the means of the Society. The enthusiasm warmed up in 1955 when a campaign for raising funds was officially opened by the then President, the late Mr John Graham of Netherby, with a target of $110,000. By 1965, the sum of $86,000 was in hand. 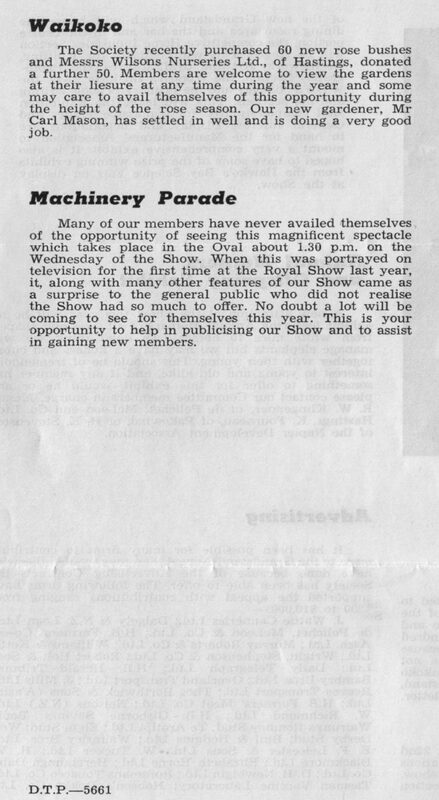 The hard work really started with the launching of the $100,000 Grandstand Appeal in 1966, which resulted in promises from our members to contribute the sum of $136,432. You will be thrilled to know that at this date $104,189 of this sum has been received by the Society. 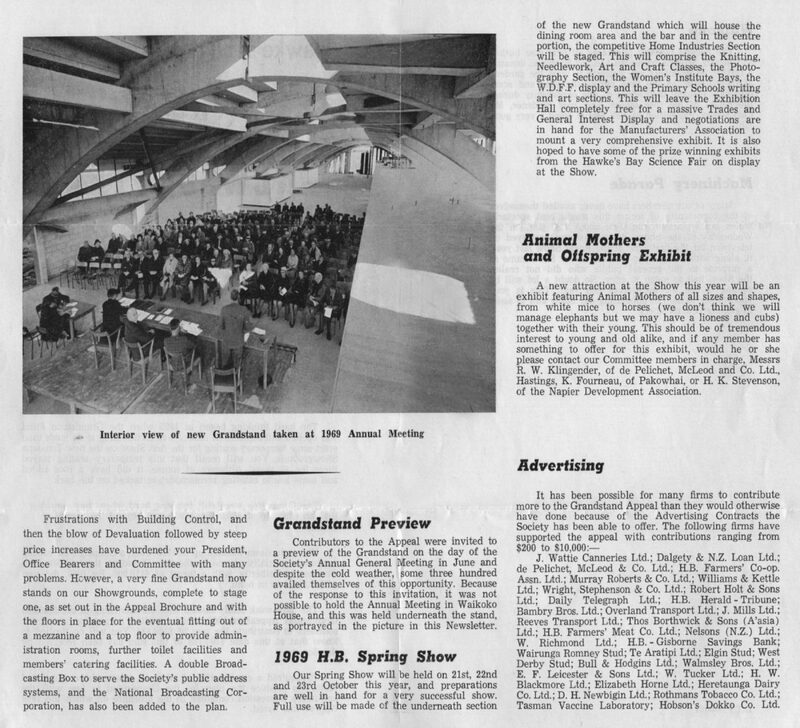 It required a combination of all three of the above mentioned factors to produce the plan for the Grandstand in line with the architect’s impression contained in the brochure on which the 1966 Appeal was based. Frustrations with Building Control, and then the blow of Devaluation followed by steep price increases have burdened your President, Office Bearers and Committee with many problems. However, a very ﬁne Grandstand now stands on our Showgrounds, complete to stage one, as set out in the Appeal Brochure and with the ﬂoors in place for the eventual ﬁtting out of a mezzanine and a top ﬂoor to provide administration rooms, further toilet facilities and members’ catering facilities. A double Broadcasting Box to serve the Society’s public address systems, and the National Broadcasting Corporation has also been added to the plan. Contributors to the Appeal were invited to a preview of the Grandstand on the day of the Society’s Annual General Meeting in June and despite the cold weather, some three hundred availed themselves of this opportunity. Because of the response to this invitation, it was not possible to hold the Annual Meeting in Waikoko House, and this was held underneath the stand, as portrayed in the picture in this Newsletter. Our Spring Show will be held on 21st, 22nd and 23rd October this year, and preparations are well in hand for a very successful show. Full use will be made of the underneath section of the new Grandstand which will house the dining room area and the bar and in the centre portion, the competitive Home Industries Section will be staged. This will comprise the Knitting, Needlework, Art and Craft Classes, the Photography Section, the Women’s Institute Bays, the W.D.F.F. display and the Primary Schools writing and art sections. This will leave the Exhibition Hall completely free for a massive Trades and General Interest Display and negotiations are in hand for the Manufacturers’ Association to mount a very comprehensive exhibit. It is also hoped to have some of the prize winning exhibits from the Hawke’s Bay Science Fair on display at the Show. A new attraction at the Show this year will be an exhibit featuring Animal Mothers of all sizes and shapes, from white mice to horses (we don’t think we will manage elephants but we may have a lioness and cubs) together with their young. This should be of tremendous interest to young and old alike, and if any member has something to offer for this exhibit, would he or she please contact our Committee members in charge, Messrs R. W. Klingender, of de Pelichet, McLeod and Co. Ltd., Hastings, K. Fourneau, of Pakowhai, or H. K. Stevenson, of the Napier Development Association. J. Wattie Canneries Ltd.; Dalgety & N.Z. Loan Ltd.; de Pelichet, McLeod & Co. Ltd.; H.B. Farmers’ Co-op. Assn. Ltd.; Murray Roberts & Co. Ltd.; Williams & Kettle Ltd.; Wright, Stephenson & Co. Ltd.; Robert Holt & Sons Ltd.; Daily Telegraph Ltd.; H.B. Herald-Tribune; Bambry Bros. Ltd.; Overland Transport Ltd.; J. Mills Ltd.; Reeves Transport Ltd.; Thos Borthwick & Sons (A’asia) Ltd.; H.B. Farmers’ Meat Co. Ltd.; Nelsons (NZ) Ltd.; W. Richmond Ltd.; H.B.-Gisborne Savings Bank; Wairunga Romney Stud; Te Aratipi Ltd.; Elgin Stud; West Derby Stud; Bull & Hodgins Ltd.; Walmsley Bros. Ltd.; E. F. Leicester & Sons Ltd.; W. Tucker Ltd.; H. W. Blackmore Ltd.; Elizabeth Horne Ltd.; Heretaunga Dairy Co. Ltd.; D. H. Newbigin. Ltd.; Rothmans Tobacco Co. Ltd.; Tasman Vaccine Laboratory; Hobson’s Dokko Co. Ltd. The Society recently purchased 60 new rose bushes and Messrs Wilsons. Nurseries Ltd, of Hastings, donated a further 50. Members are welcome to view the gardens at their leisure at any time during the year and some may care to avail themselves of this opportunity during the height of the rose season. Our new gardener, Mr Carl Mason, has settled in well and is doing a very good job. Many of our members have never availed themselves of the opportunity of seeing this magnificent spectacle which takes place in the Oval about 1.30 p.m. on the Wednesday of the Show. When this was portrayed on television for the ﬁrst time at the Royal Show last year, it, along with many other features of our Show came as a surprise to the general public who did not realise the Show had so much to offer. No doubt a lot will be coming to see for themselves this year. This is your opportunity to help in publicising our Show and to assist in gaining new members.